Practicing the four steps in a rainstorm, Mindfulness Tuesday guide Charlene Ray leads students in Mrs. Zisette's first grade class. Take a slow breath in and out. Imagine first and second graders fine-tuning their inner well-being through simple guided exercises. Mountain pose. Shake and Freeze. Rain Storm. Bear breaths. Butterfly breaths. Rainbow breaths. Hot Cocoa breaths. 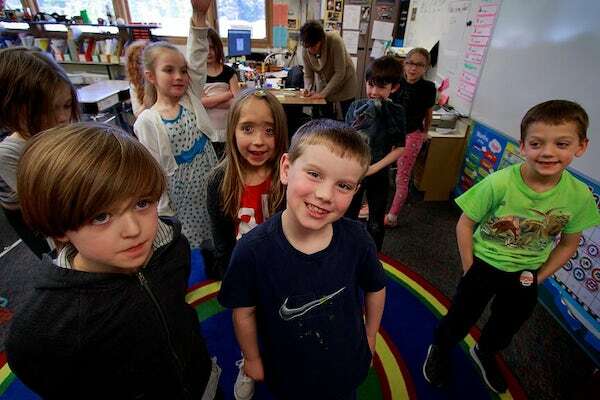 Visiting first and second grade classrooms this week, we met with students on Mindfulness Tuesday at South Whidbey Elementary School. The twenty-minute long weekly classes are taught by Charlene Ray, a seasoned social worker and counselor with more than thirty years’ experience in modeling calm and kindness. Asked if they could say what the practice does for them, student hands shot up like rockets and bodies wiggled with enthusiasm. While it looks so easy to teach students these emotional health tools at an early age, it takes practice and work to grow kids into empowered adults who learn to make healthy choices. Two friends practice mindfulness training in Mrs. Zisette’s first grade. Ray taught a rite of passage program that included mindfulness practices with South Island alternative high school students during the first decade of 2000. It culminated in a vision quest to the wilderness at year’s end. Working with Island County, she created the still-ongoing School Based Behavioral Health Services program, funded with 1/10 of one percent of sales tax. With counselors in each of the county’s four school districts, the program addresses issues of depression, self worth, anxiety, substance abuse, suicide prevention, gender issues, school attendance, and bullying, among others. Since leaving the county position two years ago to cultivate her private counseling practice, Ray now contracts with the school district, teaching students breathing and imagining exercises to help them maintain their emotional well-being and be kinder to each other. Getting ready to shake and freeze in Mrs. Zisette’s first grade class. A typical younger class might begin with the grounding Mountain Pose—standing tall with feet flat on the floor like roots, hands pointed down, head up, shoulders relaxed. Shake and Freeze: great for getting the excess energy out. Ray will say, “Shake!” and everyone shakes. Seconds later, she’ll say, “Freeze!” and everyone stops. 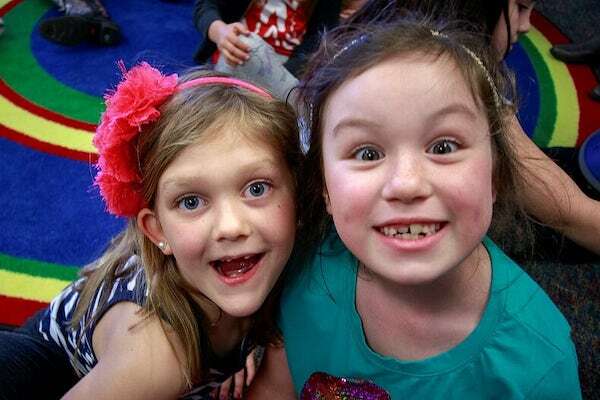 There’s low giggles around as students eye their classmates’ sometimes comical poses. Rainbow and Butterfly breaths engage arms up and down, breath in and out. With Hot Cocoa breaths, students cup their hands, taking a deep breath in and blowing out. 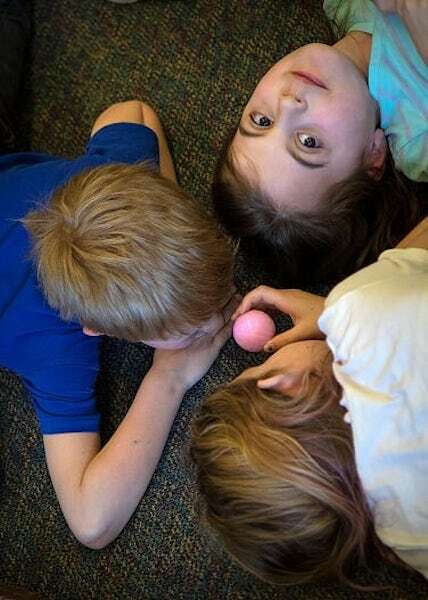 In the Bear Breath practice, students curl on the floor breathing deeply in and out, their eyes closed, imagining they are a bear hibernating, then imagining they are on a cloud. After they are asked to ‘wake up,’ there is a feeling of calmness in the classroom where before there was high energy. Ray asks students to describe their cloud. Many of the descriptions were of rainbow and raspberry and blue cotton candy; of ice cream. One student said it helped her remember her family and those who passed away. 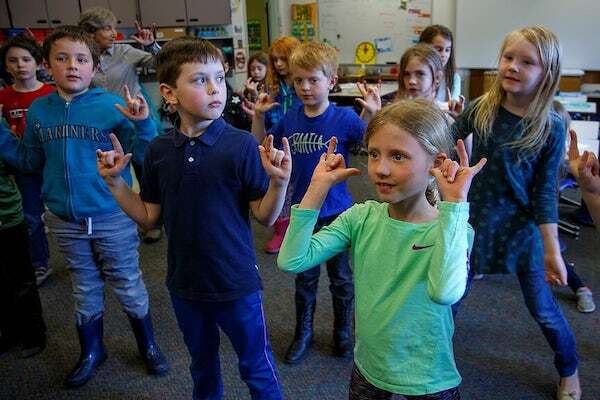 Students get into Shake and Freeze mindfulness technique in Sharla Matthews’ class. First graders in Sharla Matthews’ class were asked when they use mindfulness tools. “I use that stuff when I need to listen,” said Allee. Keegan said, “When I was angry at my sister I use bunny breath.” Bunny breath came in different descriptions: hopping, holding hands on either side of ears with fingers up—in breath—and forward—out breath; wiggling a nose up and down. “To stay calm when I’m playing games,” said Astoria. Another technique Ray teaches is Rain Storm. Wind is rubbing hands together; thunder is stomping feet; lightning is a clap; rain is rubbing hands on thighs. Students got into it with concentration. Mindfulness involves breathing, paying attention to the weather outside, the weather internally: emotions, physical sensations, thoughts, Ray said. Taking a moment to breathe deeply in and out during Bear Breaths mindfulness training in Mrs. Hofius’s second grade. In Mrs. Zisette’s First Grade students responded with energetic raised-hand-waving and lively body language when asked about mindfulness. One can tell they like this kind of learning and respond with warmth to Miss Charlene, as the classes call her. “It’s a way for me to calm down when I have a busy mind,” reports Klara. “If I’m scared it helps me calm down,” Wyatt said. Quinn said he used calming breaths when someone hit him. Maintaining a healthy and safe learning atmosphere requires focus and attention on the part of school staff and administrators. 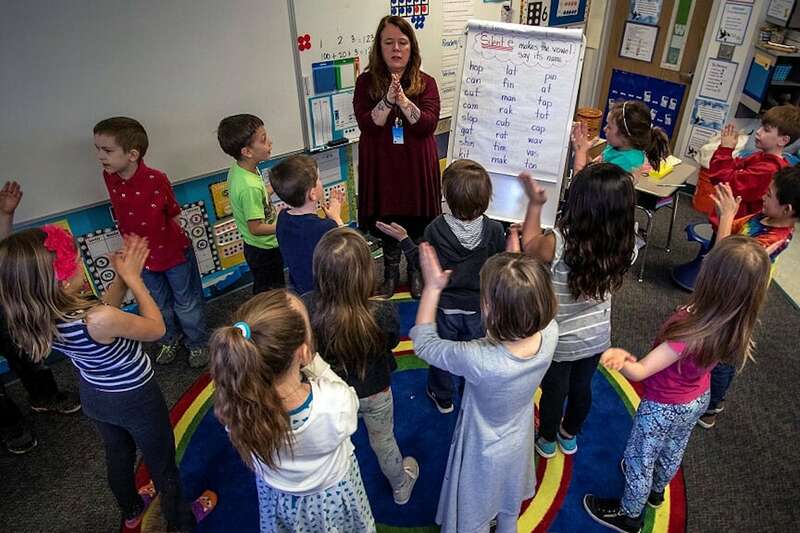 The district’s approach to addressing issues of harassment, intimidation and bullying prevention starts with cultivating awareness of what causes the behavior. One of the suggested modalities is practicing mindfulness. Ray said she has worked with district teachers in teaching mindfulness techniques and that teachers also integrate the twenty-minute Mindfulness Tuesday lessons into classroom instruction. Additionally she added that there is a connection between learning mindfulness and other social emotional skills in K-6 and having fewer mental health and substance abuse issues later on, because young people are more equipped to regulate their emotions, handle stress and cope with life challenges. 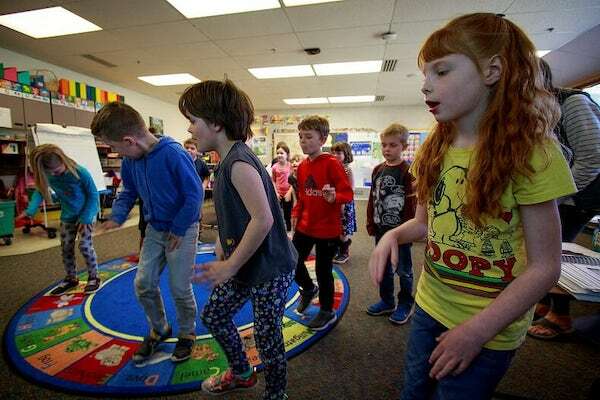 As science documents the benefits of cultivating emotional intelligence starting early with school children, the movement is taking off internationally. A documentary, Insaei, available through Sno-Isle Library’s streaming video service Kanopy, shows examples of the benefits of cultivating the practice. In the United States there’s a website with resources for Mindfulness in Schools. And Sno-Isle Libraries carry more than three dozen books on mindfulness practice and children including Breathe Like a Bear, by Kira Willey. Take a moment to breathe in and breathe out and check the weather inside and out as well. Loved the story. Ordering Breathe like a Bear so I can learn the other exercises to show my “babies.” I do a shake and freeze and some breathing ones but I looked at the book at the library and saw some many more. So, thanks for your story and Charlene is amazing. Loved it!!! You made my day!! Hopefully classes like these will become a mainstay in weekly education at all levels throughout the nation/world which could have a very positive effect in our societies.